Travel Nursing. What About When I Stop? Center in Manhattan when Hurricane Sandy hit on October 29th, 2012. By the end of that week all travel nurse contracts were cancelled,” Mary said. During 2002 when Alessio first considered travel nursing jobs were hard to find in Buffalo NY, Alessio’s home town. “A friend told me about a woman she met at the dog park who said travel nursing agencies were hiring RNs and I applied for a job. As a travel nurse you have to work in the nursing speciality that is most current for you and the travel nursing agencies generally require that you have at least a year or two experience in a nursing speciality,” she advised. When she decided to travel Alessio was working as a psychiatric nurse. her assignments were with Supplemental Health Care. “My first recruiter was Katherine Patchell and my assignment was at Greensboro, North Carolina where I still maintain many friendships that have spanned the years,” she continued. Each state also has different application requirements, so it’s advisable to access each state’s Board of Nursing website to discern if that state is a compact state, one that has an agreement with Member states to recognize each member’s nursing license. You need to know what requirements are necessary to complete the process and also become aware of the financial considerations for each state. Travel nursing agencies will help you with this. “During my 26- year nursing career I’ve worked in more than 40 hospitals and have gleaned not only more nursing experience but also good insights about being a successful travel nurse, “ Alessio told us. Expand your horizons by filling out a lot of job applications. “I signed up to work for different travel nurse agencies,” she said. 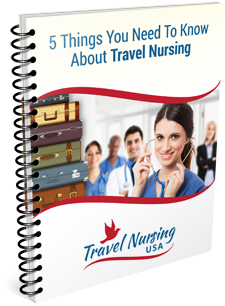 Get as much information about travel nursing as you can. The Internet is a good source because it offers a large variety of message boards and social networks like Facebook to refer to when looking for support and advice from seasoned travelers. Be flexible and think outside the box and be willing to learn different ways to do the same things. Remember, there’s many ways to accomplish the same goals, so present yourself as a pleasant and cooperative person willing to learn new skills and other ways of meeting patient care goals. Although she had planned to continue her travel nursing career a family crisis changed her plans. Alessio sought and accepted a full-time position. “Travel nursing was a perfect niche for me and I miss it terribly. However, the skills I learned as a travel nurse have been a great benefit when transitioning to full-time employment.” Alessio is employed by Headway of Western New York, a Medicaid waiver program affiliated with People Incorporated. “I’m the only nurse evaluator for six counties,” she explained. “I review people’s eligibility for nursing home transition, a Medicaid waiver program and a Traumatic Brain Injury (TBI) program. We provide comprehensive services to assist people to stay in their homes versus a nursing home. We also assist people who chose to leave a nursing home and provide them with comprehensive home care services. As we’re overseen by the NYS Department of Health, so we’re kind of like an arm of the health department,” she said. The flexibility gleaned from her days in travel nursing have given her skills to be a better nurse in her new environment. If you would like to get more information on travel nursing in general or specific travel nursing jobs in particular locations you can contact Conrad here.